Originally published under the title "Shouldn't We First Help the Christian Victims of Mideast Genocide?" The attacks underscored just how endangered are Christians who live in today's Muslim world. 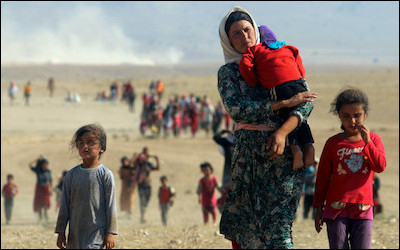 As the United States debates how many Mideast refugees to accept and who should get priority, the answer is staring us in the face: Those most in need of refuge are Christians and Yazidis who live among Muslims. And that's just this month — a typical month, sadly, for the world's Christians. The Obama administration has called for massive acceptance of Muslim refugees from war zones. The list goes on. Yet President Obama seems to value endangered Muslim lives more than the lives of endangered Christians and Yazidis. In April, America built a temporary "surge" center in Amman, Jordan, to more rapidly process Muslim immigrants from Syria. The vetting process has been "fast tracked," perhaps in order to meet Obama's desired number of 10,000 Muslim Syrians to be admitted by September. The Obama administration has called for an openhearted and massive acceptance of Muslim refugees from war zones. Democratic leaders insist that it would be wrong, morally, legally and politically, to stop Muslim immigration — but concede that it's currently impossible to identify would-be jihadists among refugees or homegrown radicals among their descendants. The United Nations has more modestly suggested that Western nations accept Muslim "women and children" first. Christian refugees are more inclined to assimilate to Western ways, or at least respond to them nonviolently. If we want to accept refugees in flight from Arab and Muslim war zones, why not start with Christians who are being slaughtered by Muslims in Muslim-majority countries? Although they're Arabs, Africans or Central Asians, the fact that they're also Christians might make them more inclined to assimilate to Western ways — and, even if they assimilate imperfectly, they're more likely to respond to Western freedoms in nonviolent ways. Recently, according to my colleague Ashraf Rameleh, a Coptic Christian advocate, "Pope Francis, who is 'building bridges to build peace' around the world, has naturally reached out to embrace Sunni Muslims." Rameleh notes that the pope has "grieved with the Orthodox of Egypt and offered his prayers over the spilled blood of Christians in Libya, recognizing the Coptic Christian martyrs." However, the pope has remained silent about the systematic destruction of the Eastern Christian Church. He hasn't supported Egyptian President Abdel Fatta el-Sisi, who is trying to break the stranglehold that the Sunni Muslim Brotherhood still has on Egypt. I have been told by the director of the Hatune Dogan Foundation, Hans Erling Jensen, that Christians stuck in refugee camps in Turkey have arrived penniless; that Muslims don't look out for them but, instead, continue to persecute them. Most are starving. Many don't have money to buy food or to pay traffickers to smuggle them out. Finally, why not bring Muslim girls and women who are already in flight from honor-based violence, including from honor killing here, next — before we extend visas, green cards and asylum to Muslim boys and men?